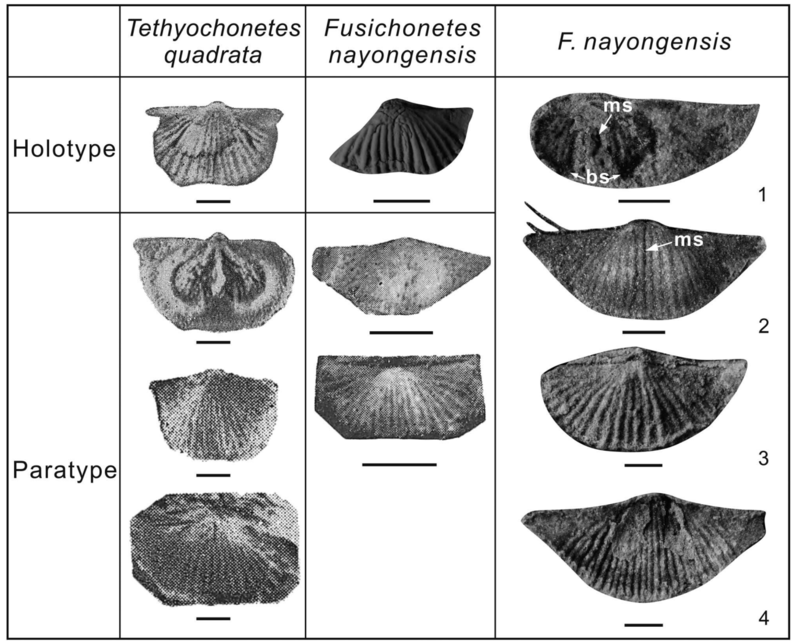 Brief summary of the paper: Two middle Permian (Capitanian) to Early Triassic (Griesbachian) rugosochonetidae brachiopod genera, FusichonetesLiao in Zhao et al., 1981 and Tethyochonetes Chen et al., 2000, have been regarded as two distinct taxa and used as such for a wide range of discussions including biostratigraphy, paleoecology, paleobiogeography, and the Permian-Triassic boundary mass extinction. However, the supposed morphological distinctions between the two taxa are subtle at best and appear to represent two end members of a continuum of morphological variations. In this study, we applied a range of quantitative and analytical procedures (bivariate plots, Kolmogorov-Smirnov test, categorical principle component analysis, and cladistic analysis) to a dataset of 15 quantified morphological variables, integrating both key external and internal characters, measured from 141 specimens of all well-known Fusichonetes and Tethyochonetes in order to test whether or not these two genera could be distinguished in view of the chosen characters. The results indicate that these two genera are morphologically indistinguishable and that the species classification previously applied to these two genera appears to represent polyphyletic groupings within the genus Fusichonetes. Consequently, Tethyochonetes is concluded to be a junior synonym of Fusichonetes. The diagnosis and key characteristics of Fusichonetes are clarified and refined based on a new suite of well-preserved specimens from the Permian−Triassic Xinmin section in South China.